A beautiful white paint finish, shaker style beaded inset cabinetry and LED lighting throughout, showcase this large His & Her Master Closet. Her side features a built in dresser with upper enclosed cabinets and a double sided island with marble top. A glass enclosed cabinet was designed to showcase her handbag collection and extra storage for accessories. His side features two large dressers, upper enclosed cabinets and adjustable shoe shelving behind mirrored doors. It's finished out with valet rods and pull out belt and tie racks. 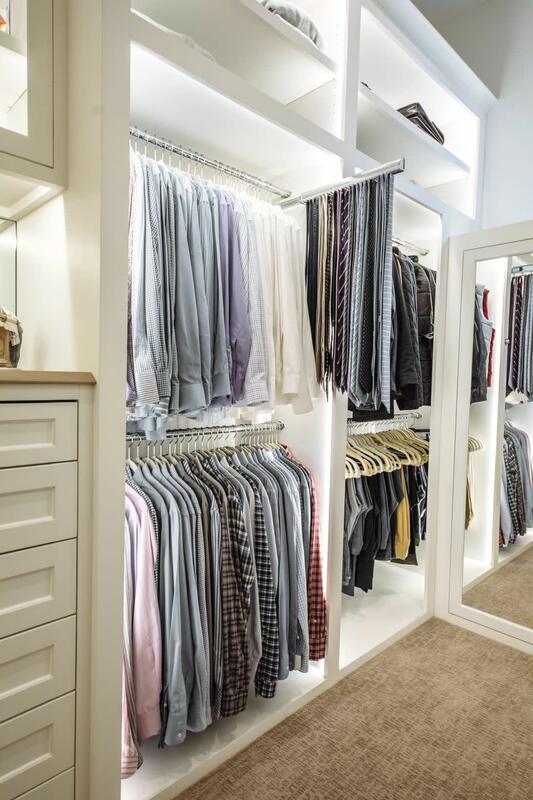 My white walk in closet is my favorite room in my new home! It's beautifully lit, there's space for all my clothes, shoes and bags and I love the layout!